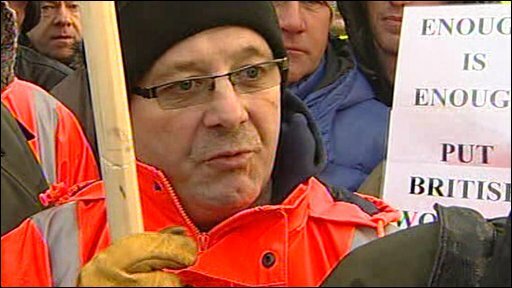 Hundreds of striking workers have taken part in a third day of protests in North Lincolnshire over the use of foreign labour on a construction site. Up to 1,000 people gathered at Lindsey Oil Refinery after a £200m contract was given to an Italian firm. Protesters vowed to return on Monday. Unions said British staff should be doing the work. Total, owners of the refinery at North Killingholme, said there would be "no direct redundancies" as a result. 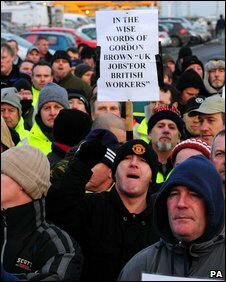 Protesters carried posters calling for UK jobs to be given to British workers. The protest was disrupted at 0615 GMT, when a car collided with an oil tanker at the entrance to the refinery. Firefighters took about 30 minutes to free the driver of the car, who was then taken to hospital. Once the protesters were assembled in a car park opposite the refinery they were addressed by union leaders. Unite regional officer Bernard McAuley told them: "There is sufficient unemployed skilled labour wanting the right to work on that site and they are demanding the right to work on that site. "Our general secretaries of Unite and the GMB have called upon the prime minister to call an urgent meeting with the heads of industry in the engineering and construction industry to clients and the trade unions to get round the table. Protester Kenny Ward told the crowd they had to stand together and take on the "greedy employer". He said: "This is what it's about, it's about collective strength. I'm a victim, you are a victim, there are thousands in this country that are victims to this discrimination, this victimisation of the British worker." Friday's Lindsey refinery protest ended at about 1000 GMT. The protest began on Wednesday with a walk-out by Lindsey workers and at least 800 people demonstrated at the plant on Thursday. The action has now escalated, with workers walking out of sites across the UK. They included employees at BP's Dimlington gas terminal in East Yorkshire and its chemical manufacturing plant in Saltend, Hull. Lindsey's Total bosses decided to invest in a new de-sulphurisation unit at the plant in 2004, and a contract to complete the work was awarded to the Californian-based engineering group Jacobs in June 2006. When additional works were found to be needed a sub-contract was awarded to IREM over six other contractors, including five from the UK. Cleethorpes MP Shona McIsaac said the decision was "like a red rag to a bull for people in our community who are out of work and who have skills that could be used in this construction project". In a statement, Total said there would be no direct redundancies as a result of the contract. "On this one specific occasion, IREM was selected, through a fair and competitive tender process, as the most appropriate company to complete this work. "We will continue to put contracts out to tender in the future and we are confident we will award further contracts to UK companies. "We are disappointed they have taken this action and we hope contractors return to work so the situation can be resolved as soon as possible through discussion with their union representatives." It said its main refining operations on the 500-acre site remained unaffected by the action.